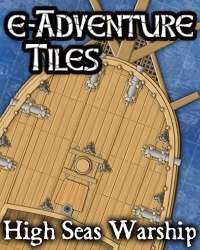 Set sail for adventure with e-Adventure Tiles: High Seas Warship. This 37 tile set features everything you need to build a four deck warship with or without cannons (up to 42 cannons!). Features include fore and stern castles, quarterdeck, gun deck, crew berth with officers quarters, a fully stocked hold, and the captains quarters and great cabin. The first two decks of the War Ship are customizable so you can have as many or as few cannons as you need and the two lower decks will be customizable when combined with upcoming High Seas expansions. The War Ship is great for use as a pirate ship, naval vessel, or cargo ship. e-Adventure Tiles are designed for use with you favorite miniatures games and RPGs by award winning cartographer Ed Bourelle. 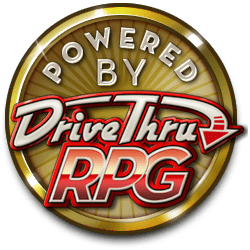 More than 30 FREE bonus tiles in one download. This title was added to our catalog on June 04, 2007.